Merge the graph of multiple Server devices, Services, Application to collectively monitor all in one screen through your custom created Dashboards. 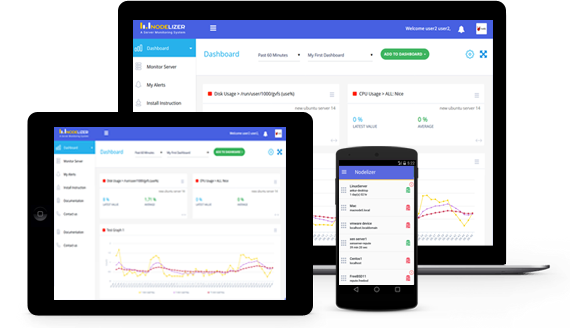 Unlimited creation of custom Dashboards to selectively add specific server device, to choose which Services applications and metrics to monitor, to view their statistics through graphs or as particular metric value. View Open-Alert-Counts for any of your Server devices. Want to compare data with previous record(s)? Your dashboard isn't limited to show only real time data, but allows you to view your historic data too. Freedom to arrange any Metrics / Alert widget / Graph in your dashboard as per your convince and priority. Nodelizer provides monitoring support in the wide range of Linux flavours like - Ubuntu, Fedora, Redhat, Debian, Arc linux, Gentoo, cloudlinux, CentOs, ... and also for BSD(FreeBSD) & Mac OS X+. The Nodelizer Agent provides built-in support for monitoring the performance and availability of numerous popular Services. Web Server : The most installed application whenever a server is concerned. Cause none of the scripts or web app or website can run without them. Web Server can be one of the root cause of the suddenly increase in the higher usage of your CPU / Memory / Network Usage. Nodelizer supports Monitoring following server: Apache, lighttpd, nginx, Tomcat. Database : Like Web Server, another root cause behind higher usage of your system can be Database Server application. The more connection, and frequently requesting a query can result into heavy usage of your system Resources. Nodelizer supports Monitoring following databases: MySql / MariaDB, PostgreSQL, MongoDB. Mail Agents : A mail server (also known as a mail transfer agent or MTA, a mail transport agent, a mail router or an Internet mailer) is an application that receives incoming e-mail from local users (people within the same domain) and remote senders and forwards outgoing e-mail for delivery. A computer dedicated to running such applications is also called a mail server. Nodelizer supports Monitoring following mail agents: postfix, exim, sendmail, zimbra, qmail. Caching Technologies : Generally, Cache is a temporary data which are stored on browser side storage for fast access instead of making a new request frequently. Well a browser doesn’t know which are important cached data and when they will be access next time. So the browser will only delete or override these cached data, if required as low space for the cache storage. Nodelizer supports Monitoring: Memcached. PHP-FPM is a process manager to manage the FastCGI SAPI (Server API) in PHP. observe vital system resources & their usage. Proactively track your Server's health & availability by collecting key system performance metrics which include - CPU Usage, Memory, Disk Usage, Load Average, Network Traffic, I/O Stats. You can also customize which are the Basic service(s) you wish to observe instead of all at once. their instance count per user. Sortable Processes List, with above details, helps you to learn the usage pattern, and prepares you against taking decision regarding preventing downtime of system and maximum availability of the running Application / Services or Server itself. Configure alerts for getting notified when certain performance thresholds are reached for any metric value or if there is a downtime. Get notified instantaneously through Email, SMS or Push Notifications to minimize server downtime and prevent any critical system issues. Repeat the same action if occurs on given time interval. Alerts are important, but do not want to monitor them against your priorities for the time being? Mute your alerts for certain time period. Easy!!! Individual Alert for specific process when it has been Started / Stopped. Server Virtualization is a method of running multiple independent virtual operating systems on a single physical computer. It is a way to save cost and energy to maximizing physical resource as virtual one against investment in physical hardware. Virtualization offers a lots of benefits to the IT operations but along comes its own share of complexities too. Thus managing a virtual environment is not as easy as it seems. Dealing with Virtual Infrastructure requires more attention to the system's resources as Server Availability is the most important thing to the clients. Without a proper virtualization monitoring solution in place, the complexities of managing virtual environments can be quite overwhelming for IT operations. Nodelizer provides IT administrators with valuable insight into the health and performance of virtual servers (installed as guest) as well as the virtual hosts configured in those servers. Currently Nodelizer helps you monitor VMWare and XenServer. You can set alerts to instantly get notified if guest is inactive as well as for the host / guest specific metrics. In the era of Internet, server monitoring shouldn't be limited to Desktops only. Native Mobile support is growing now a days like an essential part of the technology and productivity tools. With the Nodelizer Mobile app you can view all your Server, Services, Active Alert Notification and history of Closed Alerts. Getting Alert Notifications for any server issues on your Mobile device gives you a head start on the problem about what's being affected and its cause, before you actually get to fix it. While managing server, every minute performance metrics are important as you never want your server to be down or unavailable for even single minute. The system resource usage analysis helps you to learn the usage pattern by system / services and to take corrective action for preventing system downtime and make your system available all the time. Nodelizer graph let you to analyze & understand usage patterns and plan resource requirements in advance. You can easily view Your Server’s detailed historic Data, captured by Nodelizer Agent, in the Snapshots, Graphs & custom-built Dashboards(Web App only) of our Web & Mobile Application and compare data for different time periods. Nodelizer helps you to monitor your every minute data in snapshot – all in one screen for an individual server. In case of any performance issue, this can significantly speed up the identification why a service is not performing as it should. You can co-relate one metric with another one and identify the root cause of the performance issue. 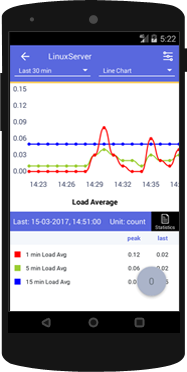 Snapshots and Graphs on the Web & Mobile Application enables you to view Basic System Metrics and Service & Application Metrics for your Server devices in Real-time. With auto refreshing charts & data, you will be updated for the latest Stats of your server device. A low footprint agent helps Nodelizer to provide you Round the clock monitoring with quick and easy installation. All you need to do is add a Server device. Once your Server device is been create – a "Server key" will be generated – Copy it. To Download the installer script - Check out the Install Instructions Tab in our WebApp. Select your server platform to view the related Installation Instructions..
Once you download the script, run the Installer script with the server key you just copied. Within the next minute you will start monitoring the health and performance metrics of your server in front of your eyes.